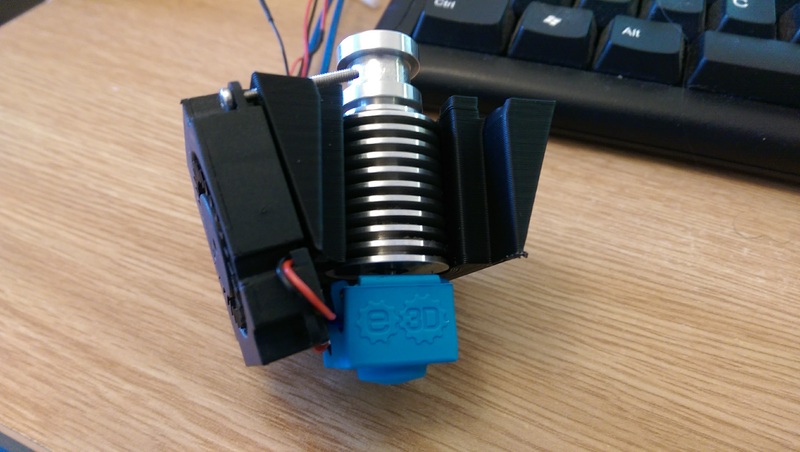 This has been moved from another thread where some optimisation of combined hotend coolers/part fan shrouds were being revisited. So far we looked at e3d v6, e3d volcano and came up with one piece, printable dual part fan, single heatsink fan coolers, which are small and light. They do work air comes out quite nicely, and they fit within the limited mass/space on delta/corexy printheads. Which is nice but takes up way too much space for a delta effector. Jinx's version - prints better, uses a bolt to secure not cable/zip ties. Which I have not published as I don't know if it works yet. But it would be nice to see what other ideas are out there and see if modifying these designs can come up with the smallest, lightest, relatively most effective twin fan cooler for these hot ends. Edited 1 time(s). Last edit at 08/11/2016 04:16PM by jinx. That looks great and if you swap from a volcano to a v6 (like I do from time to time) it will be very useful. I'm printing that volcano version now to see how it turns out. Its having to print some support for the overhang on the side fan cowls, maybe its worth putting a 40 deg slope to this area, which would remove the need to support it and duct the airflow a bit better anyway. "having to print some support for the overhang on the side fan cowls"
could be worth adding the supports into the model rather than relaying on a slicer to generate them? added a channel in the side of the shroud to run the cable and using a bit of the cable tie to keep it in place!!! that's the plan. add the stl for the adjustable shroud , just need to print it myself. If there were a slope running up to that overhang it would print more or less without support. Put one on each side and you could print it either way up in this orientation. It would also duct the air better as the airflow must be stagnant in these corners. Might work, have to try it and find out. M2 bolts a better choice for bolting the fans onto the ducts. Edited 1 time(s). Last edit at 08/12/2016 06:47AM by jinx. Looks good. Will have to print one, m2 bolts sound like a good idea. single piece shroud for the volcano, not printed it yet but should be ok " those famous last words! That looks good. If the adjustable one works then I suspect it ought to replace the non-adjustable versions as I cant see any advantage to using them except marginal weight saving of a few machine screws and nuts. But great work, these will be very useful. the adjustable fine BUT theirs that nagging feeling bolt coming loose and straight into the blades of the fan..personally I use the adjustable to set the height then glue it in place!! the advantage of the single piece for the volcano is it brings the ducts closer to the nozzle. I'm currently using this fan shroud for a more even cooling rather then using a bulky 50mm blower to one side. I've always missed the power though and noticed I still get some curling on bad overhangs -- something that PLA can do remarkably well with the right cooling. I've always had a similar idea to this fan shroud but with a blower fan. Whipped up a quick design utilising 40mm blower fans. It works surprisingly well, the heatsink fan fits very snugly with no nuts needed (uses original e3d fan and screws). the fan actually causes the mount to pinch the cooling fins, so no cable ties needed to keep it on. I may modify this further to make sure it cannot ping off at all. It then has two 40mm cooling fans on either side. I've not printed with this yet, but I may have to design some ducts which can mount to the end of each fan, or adjust the angle of the fan. These fans mount with 2x 2mm screws. Nuts can be used but the holes are made tight so the screws bite the plastic. That makes sense, the blower fans should move more air. I don't know if you've been following leadinglights high temperature chamber printer build in delta forum but he thinks a non-ducted fan with more turbulent airflow cools the part better. Is your design hosted anywhere I'd certainly give it a try. I've got a job lot of 30mm sunon blower fans on order which should adapt to it. Regardless of the result, the images look bloody good! I've been following it somewhat although not sure I buy it just yet. I believe more turbulent air is better, but I've had problems in the past where the print will duct the air straight down onto the print bed and cool it very rapidly. If you use PEI or printbite, your print will come loose quite easily. Perhaps a mixture of ducted and non ducted? Anyway, the design as it is, is not finished. I may neaten up the design a bit, change the angle of the fan, add a clip on duct etc. So far though it is actually more compact then the 30mm version you guys made, uses less screws and nuts and should deliver a lot more air. If you need a volcano version you could easily use new ducts rather then alter the fan height. This should also prove quicker if you swap between standard and volcano setups. I've attached the .stl, and will get a CAD file up when possible. what format would you like it in? I'm good with the stl for now. Jinx did most of the actual design (I am a total tinkercad amateur, at the moment). If its even more compact you've got me sold already. These are 30mm Sunon fans, and move a surprising amount of air for quite low noise levels. It's certainly a compact unit. Can't decide whether to design some ducts or not. The fans are attached with superglue, since they had m2 bolt holes and I haven't got any m2 bolts. Haven't had time to try them printing something fiendishly difficult but I will do. Oddly this was based on Orgamib's fan cowl, but mine wouldn't grip the hotend at all, so I added some m3 bolts on the back and a cable tie just to ensure it doesn't slip off. Those fans are great, aren't they? Try printing this duct in ABS or PETG and see how it goes. It should click straight onto those 30mm sunon fans, once you click off the existing face plate. I've been using a similar design for a few months on my mini, and think it works quite well. According to this doc 88CFM is needed to dissipate 500W/h at 10deltaT? I think we need better air management rather than adding more (powerful) fans. Also, from what I read PLA should not be (rapidly) cooled to less than 90degC for stronger prints. Hi newbob, I'm not sure what the first line you wrote there means, if you can elaborate? Better air management is a topic over which a great deal has been said and tried. It probably doesn't do any type of filament good to cool the filament you are laying down before it has bonded to the previous layer, which is one argument against highly directed fan cowls pointing right at the nozzle. There's two types of cooling you want, general part cooling to cool the whole layer to prevent the part melting/sagging, for this relatively diffuse airflow is best, for the layer bonding reasons stated. Then there is also the cooling you need to print extreme overhands or bridges which needs to be directed tightly to the filament as its being laid down preventing it from sagging (bridges) or curling (overhangs - airflow needs to be bi or omnidirectional for this too). Although if you want strong parts give PLA a wide berth, PETG or ABS offers considerably stronger parts, more so in terms of flexibility which resists fracture rather than pure strength. Edited 1 time(s). Last edit at 04/28/2017 09:12AM by DjDemonD. I think using 3 fans is an overkill given the amount of energy that is put into the system (I only have experience printing with PLA). From what you describe it sounds like slicer software should vary speed of the fan depending what layer is being deposited. Cool less for longer strokes, cool more when printing smaller areas and bridges. Edited 1 time(s). Last edit at 04/28/2017 09:26AM by newbob. Well one fan is just to keep the heatbreak cool to create a sharp thermal transition for the filament in the hotend and does not contribute to part cooling. The other two are 30mm blowers which along with 30mm axial fans, are probably the smallest fans in use, I have seen people running dual 50mm 24v fans which I consider excessive, both in terms of airflow, power consumption and physical size which limits print volume. For delta's corexy a pumped air system like BerdAir might be the way forward. The generally accepted rule with PLA is fans off for layers 1-3 then "fans to maximum captain" for the rest of the print. But by all means experiment. I don't mind plastics my girlfriend on the other hand feels that "3D printers would be great if they didn't make things from horrible plastic". Thanks Nebbian for the fan ducts, I'll make a couple of those later on. Edited 1 time(s). Last edit at 04/28/2017 09:34AM by DjDemonD. Is it noticeably beneficial to have the air coming from two sides vs just one side? Also, wouldn't you want them to be at a bit of an angle instead of directly blowing at each other to avoid stagnation? Yes it is beneficial depending on the filament. Abs especially curls towards the air flow so bi or omni directional cooling is best, pla and petg probably less of a problem, this really applies to the case of bridges and overhangs rather than general part cooling as abs doesn't really need it. Most ducts do point slightly downwards rather than directly at each other, although some circumferential ducts are also popular. If it isn't tight enough, scale it down slightly or up extrusion rate. I'm working on yet another fan mount at the moment... I wasn't happy with my design in the end, it just wasn't 'compact' enough and as you said the mounting option isn't brilliant. Also, dual sides cooling is definately necessary... Try printing the tree frog, and watch as the legs on one side are successful, and the other warps and curls... This really is the ultimate test for curling, as most of it is more then a 45degree overhang, with small layers as well. I tried experimenting with 'low power' cooling using a 40mm blower fan ducted into a 4mm brass pipe. The end of this pipe was then bent into position close to the nozzle. It worked somewhat, but the fan design is such that most of it just blew out the blades, rather than down the pipe. I think a 50mm would have done the job as it's a better design, where the fan blades are completely enclosed, but of course I don't have space for a 50mm fan on my gantry! Made some ducts instead of using the fan clip on casings, they were a bit fragile. I have only been printing for about 1 1/2 years, but still haven't used a cooling fan. Why do you use them? Better bridges, better fine details, better overhangs. Need more? I expect we need them less than we think but if you can think of a model that never quite prints right without fans let me try it with them. Edited 1 time(s). Last edit at 04/29/2017 09:11AM by DjDemonD.